Toilets down in the subway? Yes! 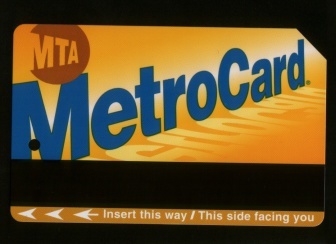 The New York City Subway is part of the MTA, the New York City Metropolitan Transportation Authority. It's an enormous public transportation system, with 468 stations in operation with 209 miles or 337 kilometers of active passenger routes. It's also one of the world's oldest rapid transit systems. Subway is the American English terminology for an underground rail network. In British English, subway is an underground pedestrian passage while a subterranean rail network is called the underground. It's the busiest rapid transit rail system in the U.S. and the seventh busiest in the world, serving 1,655 million passenger rides per year. It averages about 5.4 million rides every weekday, with about 3.2 million on Saturdays and 2.5 million on Sunday. Despite its name, about 40% of the track is above ground. It is the most cost-efficient subway system in the U.S., with the lowest cost per passenger trip and the second-lowest cost per passenger mile (behind Atlanta) and per hour of service (behind Chicago). A pneumatically powered demonstration system was assembled in 1869, although it was only 95 meters or 312 feet long. The first elevated railway was the IRT Ninth Avenue Line, which opened in 1868 and operated until 1940. The first underground line open in October of 1904. Today's J, M and Z trains on the BMT Jamaica Line cross the oldest existing elevated structure in the system, what originally was a Brooklyn Elevated Railroad between Gates Avenue and Van Siclen Avenue. 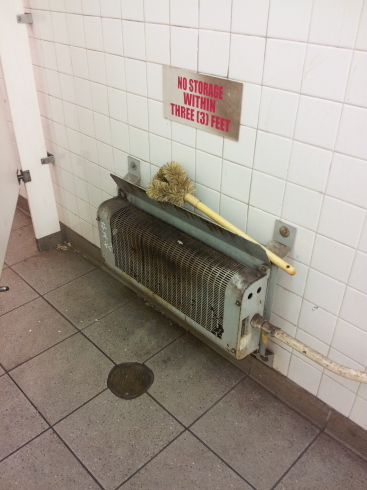 Toilets are not generally available in the New York City Subway system. 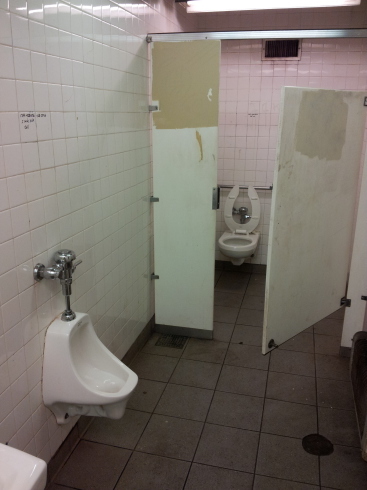 Many former restrooms have been converted to storage or are kept locked and are available for employee use only. 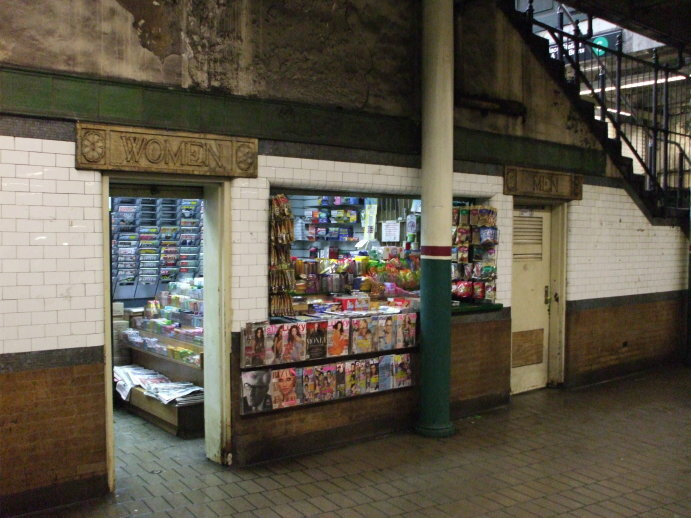 Other former restrooms have been converted to other use, like these at the Astor Place station between Greenwich Village and the East Village where 8th Street (St Marks Place) crosses the north end of Lexington Avenue. Now the door labeled "Women" leads into the newsstand, and the one named "Men" is mysteriously blank. It may be an employee-only toilet, or maybe it is just a storage area now. 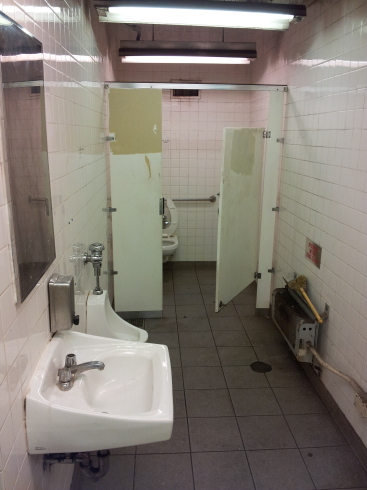 Let's take a look at some of the few available public restrooms in the New York City Subway system. 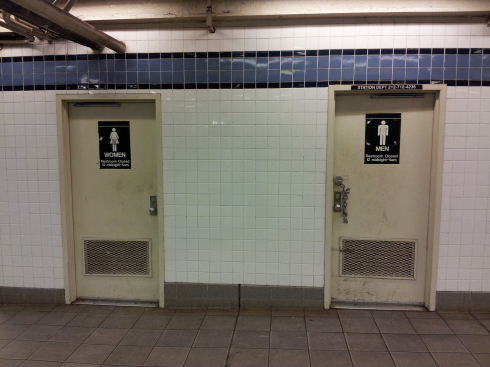 These doors lead to the women's and men's facilities in the Delancey Street — Essex Street station. 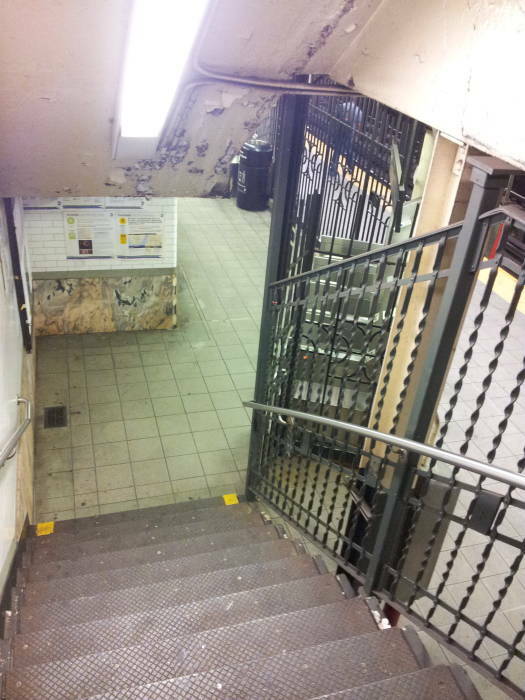 This station provides access to the of the J and Z trains of the BMT Nassau Street Line on the upper level and the F and M trains of the IND Sixth Avenue Lines on the lower level. The station is on the Lower East Side of Manhattan, just west of the Williamsburg Bridge on Delancey Street where Essex Street crosses. These toilets are on the platform of the westbound M line, which leaves this station to cross the Williamsburg Bridge to the Marcy Avenue station in Brooklyn. As the signs warn, they are locked from midnight to 5 AM daily. That's every night. The New York City Subway system runs 24 hours a day every day of the year. The city never sleeps, nor does its subway. These subway restrooms, however, do shut down overnight. If you need to clean up, a nice large scrub brush is available. 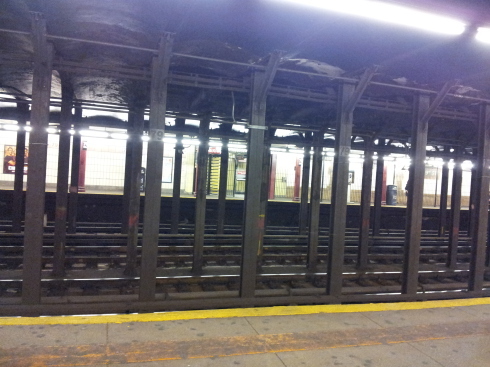 The New York City Subway is about as clean as you could expect any subway system to be. Some people say that the decrepit Washington DC subway system is cleaner, but that's just an illusion caused by its almost complete lack of light. Its architect may have been insane, or maybe the workers simply had the plans upside down, but all of its light fixtures are below floor level. The result is that you can never read the signs in the stations from the train. The announcements in the trains are usually incomprehensible. So, if you lose track of the station count, you take a gamble when guessing whether or not to get out at a station. The New York subway is far superior.